Restaurant Review: Texas Roadhouse's Fall Off The Bone Ribs | The Food Hussy! I was pretty excited when I was asked to try the ribs at Texas Roadhouse! We always love a reason to go out for dinner - especially when ribs are involved. I've also just started using SnapChat - oh my - yes you too can see me take a photo with the filter of the day and make nonsensical 10 second videos of my life. Look me up @foodhussy. I started with the house salad mainly because theirs is really good. Why? Eggs. I love hard boiled eggs on my salad! It also had cheese, tomatoes and croutons along with their delish honey mustard. Honey mustard needs a balance - some are too honey, others are too mustard but Texas Roadhouse has a great balance. Definitely a great house salad. Then the rolls! Oh the rolls! 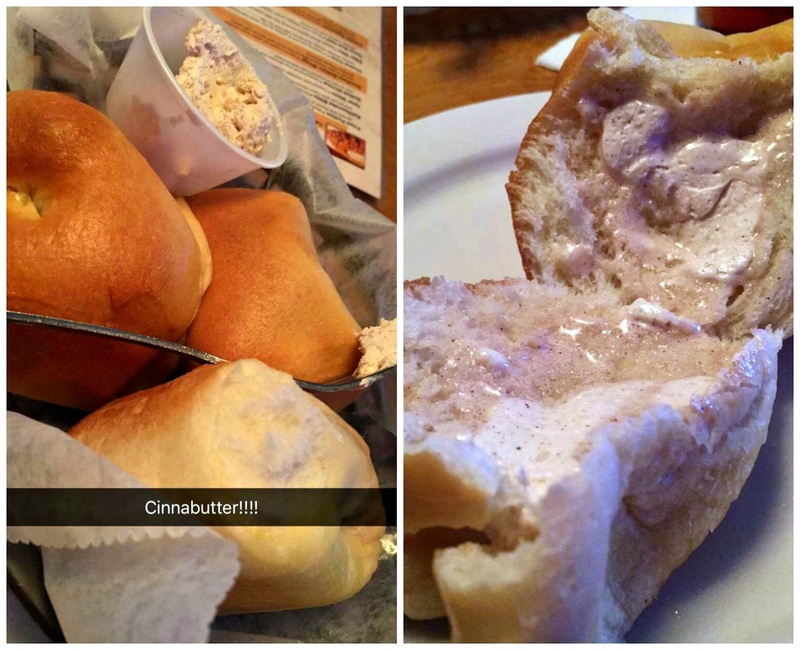 They're super soft yeast rolls and always served piping hot with a generous helping of cinnabutter. Melt in your mouth every time. but first we had to eat our veggies - right?! Here's my lovely broccoli as well - theirs is good - they add a little butter to give it some flavor - always a good thing. And back to those ribs - Texas Roadhouse does a great job because they care about more than the cut & quality - they care about the preparation! It's a 3-day process that includes a unique blend of seasonings and their signature sauce. What you end up with is fork-tender meat that literally falls off the bone! We killed the rack of ribs between the two of us - so good! I actually don't like much sauce on my ribs - I'm a dry rub kinda girl and these were great because they were sauced but not drenched. They're served with extra sauce so you can sauce to your delight. And thankfully - Texas Roadhouse wants you to be able to make your own ribs as well. Watch this video for an at home ribs recipe from the experts at Texas Roadhouse! And - if you're just too hungry to wait for ribs at home - then check their locator to find the Texas Roadhouse closest to you! Why Should You Go? Ribs. Duh!